For Metamorphosis Of Narcissus , Dali was clearly inspired by a very late 16th Century painting called Narcissus attributed to Caravaggio. Caravaggio's painting provides a perfect mirror image of Narcissus reflected in the water with the shoreline demarcating the subject and his reflection. Notably, the point of rotation in Caravaggio's painting is the highlighted knee at the centre of his painting. It is this knee, in form, shape and angle that Dali transports into his own rendition of Narcissus and the adjacent hand. To the right of Narcissus inthe Metamorphosis Of Narcissus is the form of a hand holding an egg that Narcissus has metamorphosed into that adopts exactly the same form and posture. Narcissus's form is reflected vertically in the water and horizontally by the hand. All limbs in Narcissus’s body becoming fingers in the hand, and Narcissus’s head transformed into a flower-bearing egg; the crack in the egg matching Narcissus’s hairline and very subtly echoed in the trees in the rocks in the upper left-hand and upper-right corners. The image of this egg is repeated in several other Dali paintings (Enigma of Desire, Geolyptical Child Watching the Birth of the New Man, Stage Set for Labyrinth). 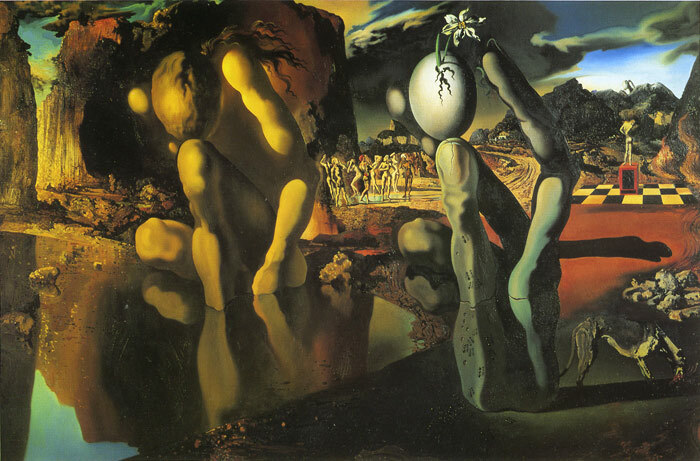 Dali claimed the flower-bearing egg was inspired by the Catalan saying “he has a bulb in his head” which refers to someone who has a mental illness or complex. Conspicuously, the life-bearing hand is deliberately placed outside of the life-giving water pool: the hand obviously not interested in its own vanity, but maybe also an ironic play on the traditional representation of water being associated with new life. Curiously, the narcissus flower itself is not a radiant example of the flower, but instead a shabby shadow of one upstaged by the erect stem breaking through the egg. In Metamorphosis Of Narcissus, Ants climb the hand that again is a recurring theme in Dali’s paintings representing decay, decomposition and death. They cluster at the base of the hand and start to make their way towards the narcissus flower, threatening its existence. The ant imagery is utilised extensively in other Dali paintings (Portrait of Paul Eluard, Enigma of Desire, Accommodations of Desire, The Fountain, The Dream, Evocation of Lenin, Persistence of Memory). SPECIAL NOTE : The painter will make the reproduction as close to the original oil painting as possible. If you want your painting to alter from this likeness, please email us and " Metamorphosis Of Narcissus " will be reproduced according to your special requirements.